Come one, come all to our exhibition at College Royal. Experience "The Circle of Food" from seed to table in P.J's restaurant in the Atrium on March 17th and 18th. 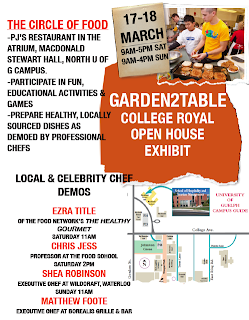 Cook dishes demonstrated by local and celebrity chefs like Ezra Title of The Food Network's The Healthy Gourmet, Chef Chris Jess from The Food School in Fergus, Executive Chef at Wildcraft Shea Robinson, and Executive Chef at Borealis Grille & Bar Matthew Foote. This once in a lifetime opportunity awaits! And did we mention, IT'S FREE! 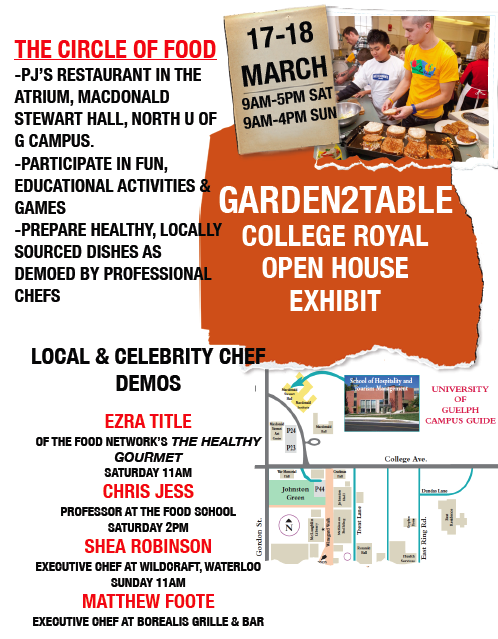 I would like to learn more about the independent study course that is offered and become involved in Garden2Table. Could some contact information be posted so that students could learn more about this initiative? Thank you.